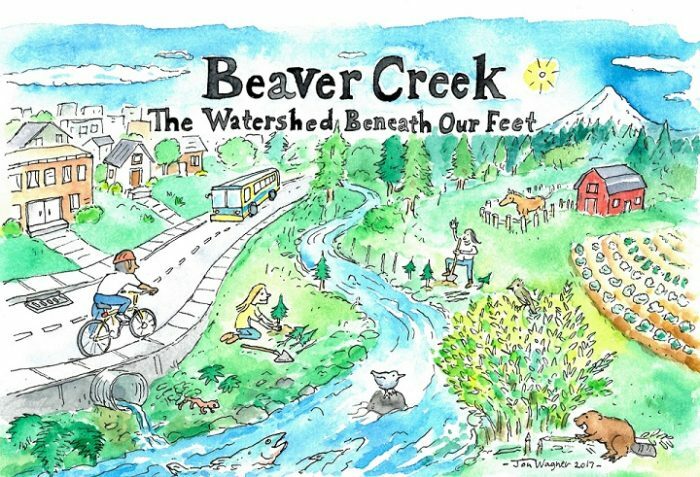 Learn more about Beaver Creek over brunch on Saturday May 4th, 2019 at Skyland Pub in Troutdale. Register here! Beaver Creek starts as a spring near Dodge Park Blvd, and flows through farms and nurseries. It passes by houses in Gresham and Troutdale where smaller creeks, like Kelly Creek, flow into it. The creek then empties into the Sandy River near Glenn Otto Park. The Beaver Creek watershed is the area of land where rain water flows towards the creek. It is home to salmon, salamanders, herons, eagles, otters, lamprey, people, and much more. What's Happening in your Watershed? There's so much happening in the Beaver Creek watershed. From volunteers restoring habitat at Glenn Otto park and Mount Hood Community College to Multnomah County's culvert re-construction projects that increase safe travel for native salmon and other important species. Click here to watch a video about the completed Stark Street culvert replacement, and click here to find information on the upcoming Cochran Road culvert project. Below you'll find the most recent Instagram photos from Beaver Creeks' hashtag feed #BeaverCreekSandy. Contribute to the story by using this hashtag to share your photos and stories on Instagram and our website.